Note: Earlier results described in the original Smelting Experiments. About a month later, we tried again. This time I ordered 8 pounds of copper ore from this store, just to be sure. I still want to smelt ore dug up by hand, but best to get the techniques down first. The ore looked to be really good stuff and definitely worth the money. Having been surprised by how low impact the first two runs were, we did this one in our backyard garden in suburban Seattle. As it got dark it ended up slightly more visible than I would have liked, but no one seemed to notice. I found a local rockyard that carried some decent looking sandstone pavers for the furnace lining. Like the second run, we didn't try to keep a real lid on the furnace, just narrowed the opening and poured the charcoal in through there. Ore was combined with the flux at a 1:1 ratio. We made a nice little party out of it, because how often do you get to show off your chalcolithic smelting skills? We also broke out the forge for people to play with, since watching the furnace burn is really very boring. It was too dark that night to break open the forge, so we just let it burn out. The next morning I found a very odd ring of moisture around the furnace body, presumably driven up as steam. We possible lost a lot of heat to the damper Seattle soil. The sandstone stood up the heat a lot better than the previous rock, but it still split in a couple of places. We removed the slag and started the tedious and messy process of copper extraction. Final results: not a lot of copper. But more than before and in a much more promising form. We also noticed that a lot of the slag felt much denser. The current theory is that we failed to keep the temperature high enough or the atmosphere reducing enough, so we got a lot of partial smelting. 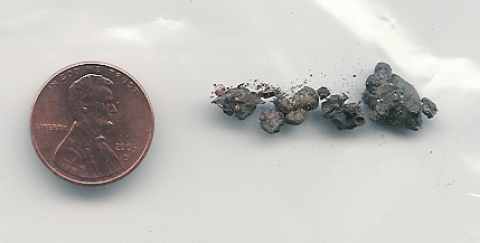 The state of the slag backs this up -- instead of a single big lump we have a lot of little nodules. The furnace design is probably to blame for this. As the burn went on, we noticed higher and redder flames shooting from it. I think that as the heat degraded the structure, more and more cracks opened up to allow oxygen in. The lack of good insulation probably hurt as well. The current plans are to build a real furnace next time using clay and sandstone bricks. This will let us define the shape far more precisely, and also help control the air flow better. As an added advantage, I'll feel better using it in the city. A fire in a hole in the ground is always a campfire, but a fire in a fancy structure might be a snobby barbeque.